When news broke of New Girl crossing over with Brooklyn Nine-Nine for a very special episode, we didn’t know what to think. 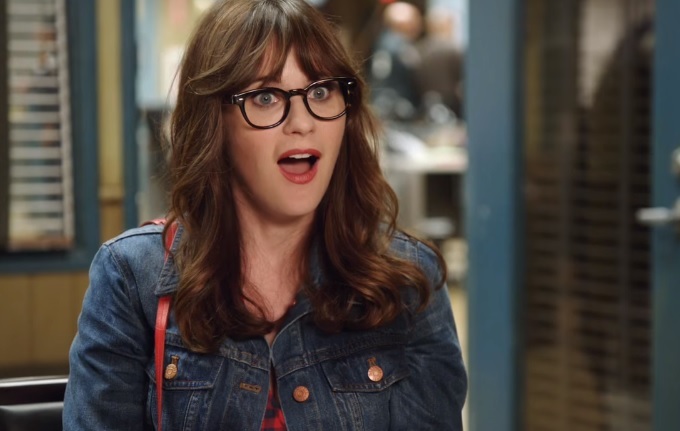 I mean, we knew it’d be fantastic — but, we had no clue as to how our ultimate favorite girl Jessica Day would react to the shenanigans of Jake Peralta. Luckily, Zooey Deschanel and Andy Samberg are both crazy-talented and seem to have a lot of on-set chemistry with each other, so we know everything will go just smoothly. It looks like our New Girl gang will be heading to New York, and that’s where the fun begins. The reason for their trip out East? Well, it’s all because of Schmidt. "Schmidt [Max Greenfield] is receiving an award from his old high school and the entire gang from L.A. has come to New York," executive producer Dan Goor said in an interview with Entertainment Weekly. "In our scene, Jake [Andy Samberg] needs to commandeer a vehicle that’s driven by a girl." As we can see, that lucky girl happens to be Jess — and as we can tell, hilarity ensures almost immediately. The real question is, what award is Schmidt receiving? And, will we get a little more on his backstory? We definitely hope so, as flashbacks are always funny. That Schmidt is one complex fella. The episode will be an hour long, and it’ll be airing this upcoming Tuesday. We can’t wait to see our two favorite FOX shows intertwine!